Consistently dazzling, even when his bold vision falters in execution, Ang Lee (The Ice Storm, Hulk) is the perfect director to translate Yann Martel's hugely popular parable into the language of cinema. As told to Martel's unnamed on-screen avatar (Rafe Spall), Pi Patel's astounding story of survival benefits from Lee's heavy stylistic hand. If you're not familiar with the source material, rest assured, there is a reason very specific to the narrative to justify all the visual flights of fancy. 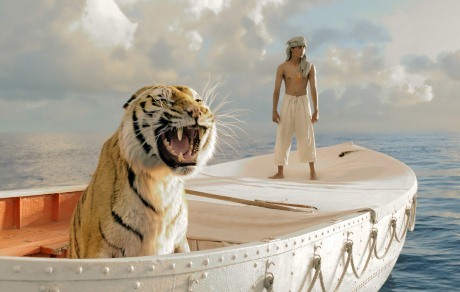 At its core, Life of Pi is a tale about the purpose of storytelling and the ambitious Taiwanese director relishes the opportunity to bath the entire production in ornate symbolism. From the humble beginnings of the multitheistic son of a zookeeper's story, which teems with beautifully composed 3D shots of exotic creatures, to the stunning, bombastic chaos of the storm that sinks the ship taking Pi, his family and their animals from India to Canada, through the young man's epic journey across the ocean in a lifeboat with a Bengal tiger, Lee uses the myth-like tale of finding your inner animal to face a beast to test the boundaries of contemporary filmmaking. Whether you choose to take every word of Pi's story literally or interpret it as deeply symbolical, it's a fantastic scenario, so that's the way it's filmed. Both Suraj Sharma and Irrfan Khan give assured performances as the younger and older versions of our plucky protagonist, but the special effects and art design are sure to get the most notice from audiences and Oscar voters alike. It's barely within the realm of comprehension that Richard Parker (the tiger) isn't a flesh and blood, giant killer cat when he's in that tiny lifeboat. On the opposite end of the photorealistic CGI used to create Sharma's primary co-star, Lee paints nearly every scene with a surreal dreamlike grandeur and finds the middle ground with a lush application of 3D that accentuates the visceral imagery, but falls short of noticeably engaging with the subtext screaming from every other pore of the film.